Raising Quality Australian Shepherds, big and small. Mini Aussies is where my program started. Now there are Mini Aussies and Mini Americans. They are all one breed but because AKC decided that there is no such thing as a mini aussie they have to carry the new name Mini American Shepherd. I have chosen to raise the AKC mini americans. So if you are wanting a mini aussie for a pet or AKC for breeding or show I might have what you are looking for. We are located in Southern Oklahoma on 300 acres in Waurika, OK. Lot's of open space for the dogs to run and play. Our dogs are bred for quality and conformation. I strive for good bone, personality, coat, and conforation. All of my dogs are socialized and love to play with other dogs and people. They love to go along for horse back rides or with the quad runner. They help do chores everyday. If you get an aussie you will never own another type of dog big or small. They are like potatoe chips, you can't have just one. Every dog in my breeding program are PRCD & HSF4 (Hereditary Cataracts) normal. Buying a puppy from Rock'n C Aussies gaurantees that the puppy is 100% clear without testing of PRCD & HSF4. OFA for hips are tested on my dogs for hip displasia too. Cheryl & Rio June 2010 won BOB under both judges at the Mini Specialty. We spend alot of time with our dogs everyday as they are not kennel dogs but part of the family. The puppies are well socialized when they leave for their new homes. I will know each pups personalities so you will know what you are buying. Your new puppy will be registered with either AKC or ASDR, and will come with up to date shots and wormings. If a puppy needs shipped I generally use a ground shipper. Besides raising puppies and having the best dogs I relax riding my horses and showing my horses. Below is Purr Cat that was shown in 2015. I grew up riding horses and love to go horse back riding and especially with friends. The happiest time for me is on the back of a horse. I really enjoy my dogs going along too. My horses consist of Tucker, a buckskin gelding by Dual Spark, that is cowhorse trained. He is also my pasture riding, fence checking, cow finding boy. He is a lot of fun to ride. Then there is Hoot, he is a son of Meacon Blue out of a daughter of Smart Little Lena. Hoot is a finished cutter with $20K NCHA earnings. He is so laid back anyone can ride him. I plan on showing both of these boys in 2018. Smart Gaviota, he is a sorrel gelding by Smart Little Lena that taught me very much about cutting. He is my retired cutting horse that is pictured below with me aboard. He carried Devin the grandson on trail rides and also playdays which they have won lots of things including trophys, many ribbons, bell boots, halters, buckets, etc. He was a great kids horse. Purr Cat is a gelding that I showed in cowhorse and stock horse shows. He now lives in west TX. Puppies are so much fun!! Here are a few that I just had to post the pictures of when they were out playing and seeing the new sights of the outside world. The group of 7 are out of a litter of 10. They were playing in their round pen with a horse very close that was kicking and bucking around. It was a great opportunity to get this great shot!!! If you are in the area please feel free to drop in and see the dogs and horses. We are always up for visits and love to meet new people and make new friends. I do travel quite a bit too so if you are interested in a puppy always feel free to ask if I might be heading somewhere. Our dogs are diffently kid friendly with our seven yr old grandson running around. 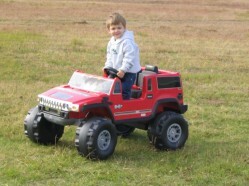 Here Devin is riding in his Hummer at age 2 showing he can drive it standing up. Devin with his puppy Allie. Devin leashed trained her himself plus he leash trains all of my pups. He is the best thing for the puppies as he loves them and they love him.